Mitsubishi Electric Air Conditioner Systems are well-known as industry leaders and has the leading-edge reputation. Mitsubishi Split System Units have been used in Melbourne homes for years. When Mitsubishi introduced its first Electric fan in 1921, it instantly became a hit! And the Mitsubishi Electric Air Conditioner Range was born. 10 years later, Mitsubishi Electric started manufacturing coolers, which proved to be just as popular as its first Electric Fan. If you are after Reliability, then a Mitsubishi Electric Aircon unit will certainly deliver. 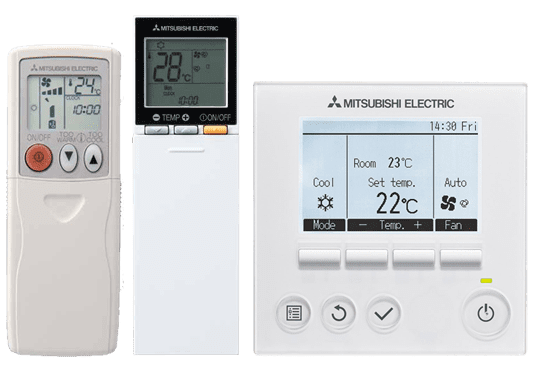 Mitsubishi’s sales of electrical ‘TODAY TECHNOLOGY’ gives the user climate-controlled comfort whether it’s heating and cooling for the home or office. Mitsubishi Electric Air Conditioner Units deliver state-of-the-art Split Systems that are not only quiet but simple to use, reliable and most importantly, energy efficient. This GL Reverse Cycle Inverter Mitsubishi Split System Range is the latest series, replacing the older GE air conditioning systems. Utilizing the latest R32 Refrigerant Gas, these Mitsubishi Air Conditioner units are excellent energy-savers. Ranging from the Mitsubishi Electric 2.5 kw air conditioner right through to the 8kW split system, these units will definitely ensure comfortable room environments in accordance with your aircon needs. If you are looking for that sleek smooth interior design, then the Mitsubishi Electric Split System Air Conditioner Signature Range is for you. Indoor Units available in 3 colours, classic white, matte silver and glossy black, these indoor units with eloquent bevelled edges with definitely express sophistication and quality. Unlike the GL Series, these units range from 2.5kW through to 5kW. These wall mounted air conditioner elegant units are designed to best match any modern décor. The FH Mitsubishi Electric Air Conditioner Series focuses on Healthy Living, prioritizing air cleaning, 3D i-See sensor, and airflow technology above all else. These units come in 3 sizes, 2.5kW, 3.5kW and 5kW, making it ideal for smaller living areas. Put your Mitsubishi Electric Aircon Remote aside and use your Smartphone to Control your Split System. As technology gets more advanced, so do these units. With an additional module, these Mitsubishi Air Conditioner units have the ability to connect to your home wi-fi, giving you the flexibility to control your unit using your Smartphone or Tablet on the go. Whether you’re at the office and you want to pre-heat your home or lying in bed and the controller is not easily accessible, this App will work wonders. This will definitely make your buying guide simple. 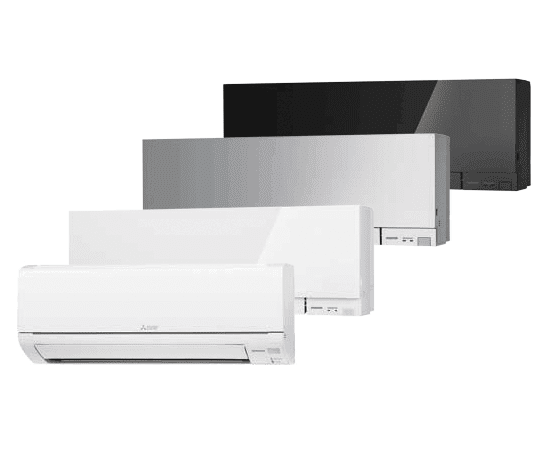 Being Reverse Cycle Split System Air Conditioners, these Mitsubishi Electric Aircon Units are perfect for the Melbourne weather, offering both heating and cooling options for all year-round comfort. Mitsubishi Electric Air Conditioner Inverter Technology regulates the temperature by controlling the speed of the motor, resulting in lower operating costs and quieter units. These Aircon units use optimum power in all heating and cooling ranges, consuming minimal energy use while maximising comfort. Mitsubishi Split System Units are built to deliver the perfect performance balance. Reliability, long operational lifespan, and low power consumption are all on the top of their list. And these units do have an impressively low power usage! In addition, these units are very quiet while it’s in its operational state. Knowing that noise can impact comfort, Mitsubishi is constantly looking for new ways to make their Mitsubishi Electric Aircon Range as quiet as possible. Recent improvements to the fan blades along with a new grille shape has made the condenser unit even quieter when it’s in Low Noise Mode. The GL Mitsubishi Electric Aircon Series comes with a Long & Wide mode, enabling you to heat and cool every corner of your home or office. Reaching out to as far as 12 metres and spreading out to a wide 150-degree angle, these units are designed to give you the ultimate comfort solution. Plum Heating & Cooling have been provided with working demo units, which are on display in their Showroom. R32 is a refrigerant with just one third the global warming potential of R410A, meaning less risk of harm to the environment. R32 enables increased energy efficiency and is said to be the next generation in refrigerants. Unlock the door to smarter cooling and heating for total home comfort. You can control and monitor your air conditioner from anywhere anytime via your smartphone, tablet or online account. Optional upgrade adapter required per unit. “i-Save” is a setting function that recalls the preferred (preset) temperature by pressing the i-Save button on the remote controller. This function contributes to energy savings when, for example, leaving the room or going to bed. Making the most of your air conditioner all starts with the controls, these allow you to create the comfort levels that match your demands. As air conditioners are becoming more advanced, so are the controls, to allow accuracy and ease of use to maximise the functionality of your air conditioner. The availability of hand-held remotes, wired wall controllers and internet connectable controllers, not only provide you with a wide variety of choice, but also allow optimised programming efficiency. Need a Quote? Speak to the Experts at Plum Heating & Cooling or Fill in the Quick Quote Form and a Representative will get back to you. "From the first call to the office ,diagnosis of problem and to the installation of a new central heating unit for my elderly mum the service was fantastic! The staff were very thoughtful, let us know when they were on their way. Ensured that we understood the whole process. Thanks Stuart, Aden, Luke and the office staff! Well done, there is a reason they won the Business awards!"